The following describes the refurbishment process Pinball Medic uses on all the games we service, sell or restore at our shop in Austin, Texas. PINBALL MEDIC knows there is a technical difference between game refurbishing and restoration. We believe refurbishing is less extensive then a restoration. First a refurbishing is performed. If a more detailed game reconstruction is required (control panel component replacement, cabinet painting, side art and control panel art replacement, etc.) then a restoration will be necessary. This refurbishment process should be used only as a brief description of what PINBALL MEDIC does and not as a refurbishment guide. Too many good playable arcades have met their demise because of repair and refurbishment inexperience. Some steps in the refurbishment process can't be undone if done incorrectly and can destroy irreplaceable parts. If you want to see what can go wrong, see our Coin-op Catastrophe Collection page. 1. The arcade game is carefully examined for obvious electrical or electronic damage. Printed circuit boards and their components and monitors are check for any defects. Inspections are made for any mechanically broken / bent control switch contacts, game control panel defects, burned circuit board connectors / wiring harness, bad capacitors, missing parts / paint, cabinet wear, side-art, marquee, video screen damage etc. This is done long before power is applied to insure no damage is done when the video game is powered up. 2. Very valuable, sometimes irreplaceable parts are removed for long term storage. Video screen and marquee glasses are removed and stored in special made frames so that even a dropped tool can not harm them. Broken monitor CRT's and other glass game parts can turn a $800 arcade into a M.A.M.E. cabinet. 3. The game is thoroughly vacuumed out. This step is necessary to remove all the dust and hazardous loose metal screws that can cause shorts and other electronic circuit board damage. Plastic parts are now removed and will be cleaned with special cleaning solutions. 4. The outside of the cabinet is now cleaned. The process we use will clean and rejuvenate the wood, side-art, game controls, plastic and metal parts, etc. This step is not always done with as must attention to detail by our competitors and is one of the many reasons we consider our games to be superior to the competition. 6. After refurbishing / restoration, all games are powered on and played occasionally for 12 hours to insure quality of product. PS1. First, the power supply board is removed. This board usually can be identified by the large capacitors, heat sinked power transistors and full-wave rectifiers onboard. This board usually has the most "issues" with it and can be the easiest to troubleshoot. Also, because this one board supplies all the operational voltage to every other circuit board, it can offten distroy the other game boards because of a faulty voltage regulator. Overvoltage can distroy every logic chip in a game so we check out the power supply before we plug in a new game. The large (size & value) filter caps are usually 20+ years old and are dried and fried out. Replacement is mandatory. The second weak point is the connectors on this board. Some usually are over-stressed and can be brown or blackened by the 10 to 20 Amp loads placed on them. The connector most commonly found burnt are suppling the five volt logic, coin lockout coils or general illumination lights. If there is an obvious problem with one then both the male and female connector will be removed and replaced. Removing just one of the pair is just inviting the same annealing and corrosion to take place again. Never use steel wool to clean contacts or any other part of a printed circuit board. They may make the board look clean but leave hazardous metal fragments. No spray-on chemical contact cleaners are ever used. All contact cleaners leave residues and will facilitate corrosion in the long term. PS2. Fuses and their holders are a weak point in the power supply system which is the source of most problems with game longevity (monitors are a close second). Corrosion, burnt or broken fuse holders are the most common culprit. All of these parts are checked and replaced if needed before power is applied. Also, all power and edge connectors, along with the entire wiring harness is checked. PS3. After unplugging all of the system boards except the power supply board, the game is powered on and the Power Supply system is tested to see if it is within specs. Often an isolation transformer is used to power the monitor. This transformer is checked for proper voltage output. 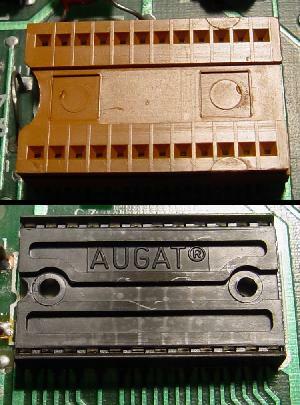 If any component is found not to be within spec, the power for the game is removed and the defective parts are repaired or replaced. GET1. Once the power supply is rebuilt, the MPU or CPU board is inspected. If there are large electrolytic capacitors on this board they will be replaced. If this board has enclosed chip sockets, they will be replaced with new mechanical style chip sockets. These enclosed sockets usually have a 90% failure rate. They were the cheapest sockets on the market at the time and hence were widely use by video arcade manufacturers. They tend to work for about five to ten years, tarnish and stop making contact with the chip pins. PINBALL MEDIC either charges a fee for replacing these chip sockets or may refuse to fix a board with them on mail-in boards. GET2. Most problems with the electronics on video games are caused by a bad PROM (programmable read only memory) or ROM (read only memory). All Proms are removed one at a time and checked against a known good set. While this test will indicate most ROM problems, some will pass this test only to be proven defective in game operation. This is due mostly to corroded PROM pins, defective chip sockets or shorted printed circuit traces under chip sockets). This is why it sometimes takes hours to test and repair a game's program PROMs. GET3. All connectors, wires, switches from both the coin door and game control panel are checked and replaced as needed. We pay special attention to components like the coin lockout coils (on the coin door). These coils stay energized during game play and are subject to heat stresses. While they may appear to be functioning properly, most are shorted out. This causes excessive current draw for the power supply. The power supply burns out over a long period of time and sometimes does damage to the rest of the game's electronics. If parts like this are not checked, they cause the game to malfunction, usually right after the warranty expires. GET4. The majority of possible operational failures have been corrected at this point except for the second most problematic part on a Video Arcade Game, the sometimes hazardous to work on, Video Monitor. This repair is discussed in the next section and is performed at this step in the Video arcade game refurbishment process. GET5. After the video monitor is refurbished, the MPU board is now ready for game play testing to take place. The MPU board is now connected to the power supply board, monitor and game controls. This will allow the self-test mechanism and more complex tests to do their function. If the board or other game component is proven to be defective, it will be put through more diagnostic tests to identify the problem, either by the use of a test ROM, logic probe or other specialty testing equipment. AMR1. The monitor is visibly inspected for obvious defects either physical or electrical in nature. For safety reasons, this is a hands free, tool free first inspection. If the monitor has server burn-in, physical or electrical defects on parts that cannot be replaced with new parts, then a new monitor will be placed in the game. Most monitors cost between $300 and $600 or more depending on size and resolution. They are not made anymore, so only monitors left in parts dealer's inventory can be bought. This has resulted in used monitors that are worth more then a working video arcade game. Some repair shops have started to buy working games just for the monitor inside of them. They through away every other part of the game. Spending a lot of expensive labor troubleshooting damaged or server burnt-in tubes and monitors is just not monetarily sound, even with the higher monitor prices. However, some types of monitors cannot be replaced with new ones, such as color X Y vector monitors used in games like Tempest. AMR2. The monitor's CRT (cathode ray tube or picture tube) is discharged in a safe procedure before removal from the game or any other repair is attempted. Many a technician has been burnt, shocked, or has suffered other bodily harm because this was not done before the monitor was removed from the game. After a monitor is removed from the game, all large monitor capacitors are discharged so they no longer pose a threat. NOTE: A picture tube is almost the perfect capacitor and can hold a lethal charge (15,000 to 20,000 volts) for four to five days or longer depending on humidity and discharge paths to ground. This is one of the reasons why we can't repair monitors in the field, only at our shop. We must remove the monitor as field service and discharge them in the field. AMR3. All monitors receive a new monitor electrolytic capacitor kit (recap kit). This can solve many problems with screen size, tracing, brightness, roll, pin cushion, color and other image defects. These recap kits are inexpensive and eliminate extensive labor in the long run. They also increase the longevity of the monitor. Most monitors where designed to operate for three years or less and not the 10 or greater years that they have been in operation. We have Arcade Monitor recap kits on our Arcade game Parts page. AMR4. The monitor's Video / Control input and power supply connectors are checked and replaced if needed. This is a problematic area and is sometimes hard to find during game operation if it is not checked at this time. AMR5. The Video input connector is now disconnected so the monitor can be powered on and tested for High Voltage flyback operation, EMI interference, CRT filament heating, etc. The monitor is connected to a known video source to check for proper operation especially if the game operator has indicated that the monitor was the only problem with the game. The monitor is benched tested using color bar / pattern generators, a high voltage probe, oscilloscopes, etc. Each section of the monitor is tested. This will determine if the problem is related to a bad picture tube, high-voltage section, mal-adjusted control mounted on one of the printed circuit boards, a magnetically charged video screen, HV flyback or semiconductor failure, faulty convergence adjustment, etc. All defective components are replaced with new parts and the monitor is retested for correct operation. If the picture tube is found to be at fault, then a new monitor will be installed. The CRT tube in most circumstances cost about as much or sometimes more then a new monitor does, if one can even be purchased. All monitor connectors are reconnected after these tests are made. AMR7. If the monitor is deemed reliable and the image is sharp, it is discharged, demagnetize and installed in the game using only hand tools. Electrical tools like drills, electric screw drivers, etc. create the possibility of re-magnitizing the picture tube (CRT). AMR8. The monitor is tested in both the built-in video test modes and in game play mode. It is tested and adjusted for color,sharpness,size,sync, etc. Only after a game refurbishment is complete, can any major reconstruction operation be done. This brings a game up to our high playability and appearance standards. A restoration process may entail taking the cabinet apart to replace rotted wood, extensive cabinet repair and other large carpentry related activates, side-art and control panel art repair/replacement. Coin doors are sometimes scratched, rusty, dented and have to be replaced / reconditioned. Marquee's and screen decals can be perfect except for small nicks in artwork. Joysticks and other control devices may be broken and in need of replacement. All these repairs are very time and labor intensive and can add as much as 20 hours to a video arcade game's resurrection. The game will now look and play like new. If economically feasible, Side-art and video screen insert touch ups will be done at this time. Nothing will be done to a game if it does not increase a game's resale value, longevity or playability.